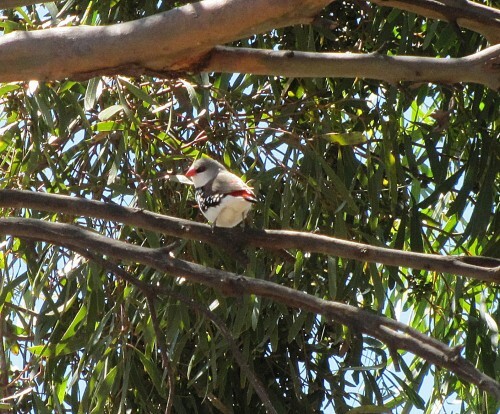 Diamond Firetails are one of Australia’s more beautiful finches and I am pleased that I can see them within a short distance of my home in Murray Bridge, South Australia. In fact, we have occasionally seen this species in our garden, and on one occasion one even came to one of our bird baths. Diamond Firetails are widespread in this region without being very common anywhere. In my experience they are usually encountered singly or in a small flock of only a few. The bird in several of the photos today was one of about four we saw at Brown’s Road, Monarto near Murray Bridge several years ago. The photos aren’t brilliant because these birds were rather wary and didn’t allow me to approach too close, even with the 20x zoom on my camera. Australian Finches would have to be on many people’s lists of beautiful birds. Some, like the Gouldian Finch of northern Australia, are simply stunning. It is no wonder that they are highly popular with aviculturalists. The Diamond Firetail is a small bird some 12-13cm in size. It has a bright, unmistakable red beak and red rump with a black tail. 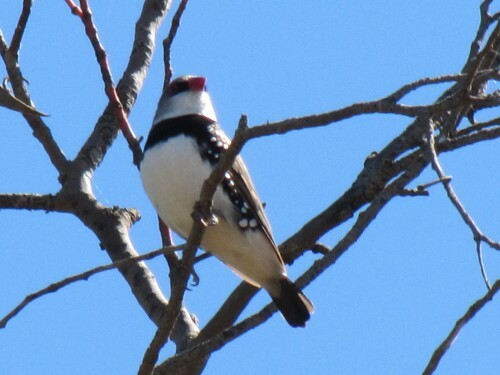 Its throat and breast is white with a black band across it. The white spotted black flanks give it the appearance of diamonds studded along its sides. An unusual sighting of this species was recorded recently near Callington (about 20km west of here). A large flock of over 35 was reported on Birdpedia. I have usually only seen them in ones or twos.